There is a new children’s book about Pony Swim that will be released during Pony Swim, Wednesday, July 25. Nicholas Goes To Pony Swim! is a 6 x 9 inch paperback pictorial journal of a little boy’s first exciting visit to Pony Swim. Nicholas Goes To Pony Swim! describes Nicholas arriving at Chincoteague Island, riding a bus from the high school, playing in the mud and water at Memorial Park, watching the ponies swim, parading the horses to the fairgrounds, riding the carnival rides, watching Misty at the Island Theatre, and even getting on board Chopper 10. That’s a LOT for a little boy to do in a single day! As a bonus, the authors hid a horseshoe on every page for little kids to find. The book is written by a former Parksley resident, Gordon Cuthrell and current Parksley resident Nicholas Johnson. Books will be available in Chincoteague at the Island Theatre and Sundial Books and in Parksley at Jaxon’s Hardware for $5. The author will be having a book signing the entire week of Pony Swim in front of the Island Theatre in Chincoteague from 10 AM until 1PM. Thanks for printing the press release about the new book Nicholas Goes To Pony Swim! I particularly liked the picture of the pony swimming that you added. 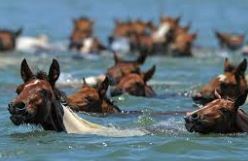 I will be in Chincoteague the entire week of Pony Swim. Before I leave, I will try to stop by and hand you a couple of copies. Thank You. Where can we buy a copy ? Note: I know Lemontree gallery in Cape Charles has copies, and possibly Sundial Books on the Island.